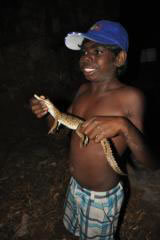 Cane toad’s vital ‘key’ to Indigenous ‘kids at risk’ in Kununurra! Kununurra businesses and homes are literally ‘under siege’ from up to 60 young Indigenous children roaming the streets night after night. Breaking and entry and incalculable costs of damage to infrastructure and local business has increased to levels that have long term residents deciding to retire elsewhere and is effecting the social and economic progress of the town. Sadly these children have no supportive ‘home’ to go back to and the ‘street’ is often safer than the family environment they belong to. 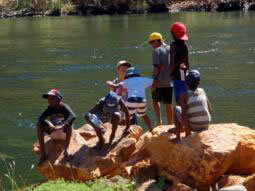 Toad busting has become the social ‘glue’ for many of these children and Kimberley Toad Busters, in partnership with Save the Children, the Justice System, and volunteer community members have been using this unusual activity to keep many of these children otherwise engaged. Positive Outcomes Program to address social issues within the community associated with juvenile delinquency” stated Danielle Taylor, KTB Board member and local KDHS teacher. She went on to add “The program aims to reduce antisocial behaviour, increase self-esteem, create positive leadership abilities, create self-awareness, and increase school attendance amongst the youth of Kununurra”. In collaboration with a number of government organisations including Save the Children, businesses and individuals KTB held their first weekend “testing the waters’ program on the 14th and 15th of this month. The target age was between 9 and 12 years of age. “The weekend was an enormous success with all the kids who attended asking to come back for the program” stated Ben Scott-Virtue, KTB Field and Education Coordinator. 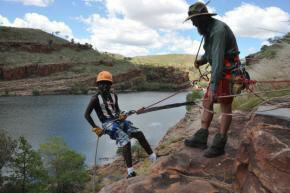 “All participants had to canoe from Lake Argyle to Go Wilds Adventure Tours camp on the Ord, a distance of around 30 km, then prepare their own camp, help with the preparation of the meal, toad bust and record native biodiversity, as well as abseil down a cliff so none of it was easy” he further added. “Other activities included learning about local flora and fauna, nutrition and cooking, uses of various pieces of equipment, and local laws, learning bush survival skills and much more” said Danielle Taylor. Lee Scott-Virtue, President & founder of Kimberley Toad Busters added “without the collaboration of businesses such as Lake Argyle Cruises, Go Wild Adventure Tours, Triple J Tours as well as the involvement of individuals such as nutritionist Steve Stevets, Paul Mock from the Sandalwood Sanctuary and Kununurra Youth Group, Bob Cooper, Bush Survival Expert, and visitors Sam Murray, Managing Director of Rustic Pathways and Nick Brockhoff from Operations Flinders this first ‘trial’ would not have been nearly as successful”. She further added “we will now start preparations to begin the proposed full 5 week Kids @ Risk Positive Outcomes Program”. Candidates for the program are qualified through the various agencies involved such as Save the Children, Justice System and the local police Department using set criteria to increase the likelihood that positive outcomes are achieved by participants. The target age range for participants in the program is nine to twelve years of age. Once candidates are qualified they are guided through the 5 week intensive program that focuses on building social skills and developing positive leadership qualities. Desired outcomes of the program are tracked and monitored for progress by the participants and ongoing opportunities for further participation is dependent on improvement in / achievement of the desired outcomes. Family and community input is an essential component of the program. Positive leadership and social skills are developed through role modelling and mentoring and therefore candidates and their families are expected to make a commitment to the full five week program. Each individual candidate will have an individual mentor, someone who is involved in that candidate’s life (e.g. older sibling, grandparent, neighbour), who is at least 18 years of age. It is the mentor’s role to also commit to the five weeks and offer a reflective period with the candidate after each of their sessions and assist them throughout the five weeks to maintain their commitment. Mentors will be offered the opportunity to undertake activities similar to those offered to the candidates. This will allow relevant talk between candidate and mentor, and give each mentor the same knowledge and experiences that the candidate undergoes. Candidates in the five week program work through the three phases of I Do (Leaders), We Do (Together), You Do (Kids) with each session they attend in order to build a sense of competency and achievement with the aim to continue in the program in a mentoring role to further candidates as they develop social and leadership skills. Having activities from each organisation minimises the time that the candidates may be unsupervised and unguided. It is important for the candidates when developing their independence and competency to attend consistent guided activities and reflect upon those with their mentors. The program aims to assist in integrating the candidates into mainstream society, whether it be attending school or behaving in an appropriate manner when at or away from their home environments. When measuring whether the project has achieved its expected outcomes observations will need to be made about whether or not a reduction in the number of anti-social behaviour among the youth has occurred, if there has been an increase in school attendance among participants. Follow up sessions will need to be conducted in order to converse with participants and their mentors in order to reflect on their experiences and whether or not they are making a difference in their lives.